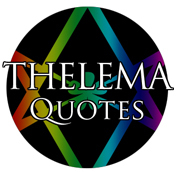 Thelema Quotes #16 will look at the role of the mind, thought, and Reason in Thelema. As always, all quotes are from Aleister Crowley or The Book of the Law. “I distrust any thoughts uttered by any man whose health is not robust. All other thoughts are surely symptoms of disease. Yet these are often beautiful, and may be true within the circle of the conditions of the speaker. And yet again! Do we not find that the most robust of men express no thoughts at all? They eat, drink, sleep, and copulate in silence.